We recently reinstated the Sunspun tradition of holding classes and problem-solving clinics here in the shop and we were very excited to see our very first class run last Wednesday evening, a beginners crochet class with our ace crochet teacher, Raynor! Raynor has been teaching people to crochet for a number of years and has that natural teachers knack of always being able to find a way to explain things in a way that everyone can understand. His next class is Next-step Beginners Crochet (running on Wednesday June 25th) takes beginners through the more complex crochet stitches, reading charts and patterns, increasing and decreasing to enable them to move beyond the granny square into garments and complex motifs. When we were putting together the class program for the year, we thought a lot about what we felt our customers wanted to learn, as well as the questions that we most commonly get asked in the shop… and, without a doubt, the biggest challenge that most face is the not the knitting but the finishing of garments: picking up buttonbands neatly, joining in new balls of yarn, easing in sleeves and, most reviled of all stages of knitting for many knitters, the sewing of seams. With these in mind, we offered two particular classes that should relieve the stress: Finishing your Knits (which covers all these skills and more and is next running on Wednesday July 9th) and Seamless Knitting, which enables you to avoid quite a few of the finishing processes completely! The beauty of seamless knitting (whether you’re talking cardigans with no side seams or knitted cuff-to-cuff, jumpers and hats knitted as tubes from the bottom up or top down or garments with even more unusual construction methods) is that you don’t have nearly as much work at the end of your knitting in order to turn all those curly little pieces of knitting into a garment. You’re generally almost there when you cast off. And you also get to try on your garment as you go, so you’re more likely to end up with something that fits well. Sometimes seams are important for helping a garment to stay in shape or to sit properly on the body; at other times, such as in baby and children’s garments, hats and some garments, they make no sense at all. 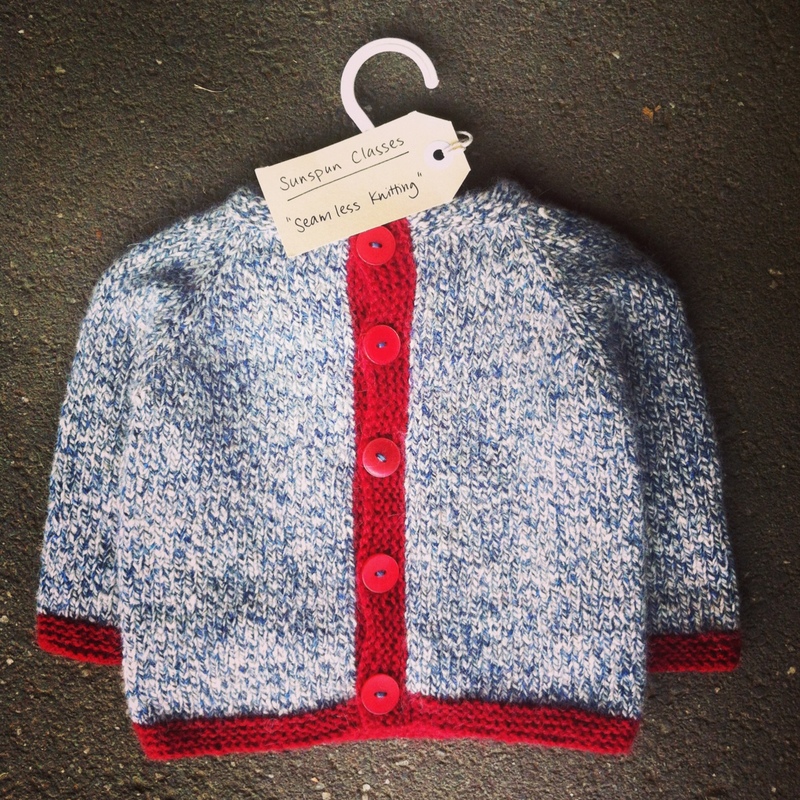 We recently put together a series of samples of baby knits for the shop and, having been knitting seamlessly for quite a while, were quite taken aback by the amount of finishing to be done for such tiny garments- and, more importantly, the bulkiness of the seams that you really don’t want in little people’s garments! So this 2-session class is all about learning to construct and knit garments in whatever way suits your needs. Participants will make a super-simple seamless baby cardigan that is knitted in one piece from the top down while learning all about the tools and techniques involved in seamless knitting and discussing the various methods of construction and how to convert patterns for conventionally-constructed garments (and other items) into seamless ones. Some knitting will be required between classes. The class runs over two consecutive Wednesdays, June 11th and 18th, from 6-9pm and costs $120. We have a few places left so call or email us if you’d like to book a place. You really won’t look back, once you understand how easy it is to work seamlessly! Categories: Classes, Sunspun news | Tags: knitting, knitting classes Melbourne, seamless knitting, seamless knitting class, Sunspun | Permalink. I am sorry to have missed this, but didn’t get email in time. Will you do the seamless knitting class again? And are you going to offer them other than a Wed night? We don’t have any plans to yet Kerry but if there’s enough interest we will. What night works for you?